I took a trip down to Barnes last week (for my non-London readers, if you're a North Londoner, going South of the river, *gasp*, feels very daring!) to meet this beautiful new mum, Sarah, and her 6 month old daughter, Clemmie. Clemmie is the sweetest baby! She looks like a little doll, full of smiles and gorgeous, twinkly expressions. She's just learnt to blow bubbles so the delicious, chubby-cheeked giggles were interspersed with some brilliantly rude noises! It was a warm, Spring day and we spent most of the morning in the garden, blowing bubbles, singing 'Row your boat' and relaxing while Clemmie's beloved dad had her in stitches! I can't verify what he was doing as he was mostly jumping about behind the camera but I'm pretty sure there was comedy dancing involved! When I arrived, Sarah told me that Clemmie had gone the whole morning without her usual nap (she was obviously excitedly anticipating her photoshoot! ), so we made time for some quieter moments, including a milk break. Apparently, Clemmie always curls her toes when she drinks her milk and I managed to get a lovely photo of those tiny feet, curled up with pure pleasure! It's precious little details like this that are so easy to forget as babies get older. After a bit more play, it was definitely time for a nap and I'm pleased to say that all those close-ups had exhausted Clemmie and she went to sleep instantly. 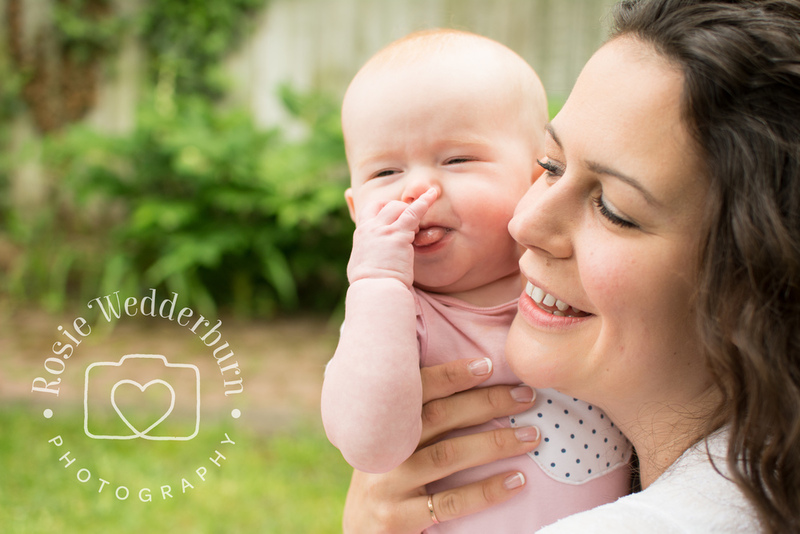 Rosie Wedderburn Photography: available for photoshoots and baby sleep training! It was such a lovely morning, South London turns out to be really quite nice (!) and I absolutely love the photos of this beautiful mum and baby. I can't resist finishing with this peach of a photo (below) of Clemmie looking totally gorgeous and serene, cuddled up to her mum. See what I mean about that perfect, doll-like complexion? What a beauty!